This year we were delighted to take part in the National Ploughing Championship 2017. Since its inception, the National Ploughing Championships has become much more than just an annual inter-county competition; it has become an intrinsic part of Irish rural life. It is now no longer just for ploughing or machinery enthusiasts, the modern event now features something for just about every member of the community including a Food Fair, Craft Village, Livestock, Lifestyle and a Motor Show. Along with this, there are many entertainment and special events taking place. 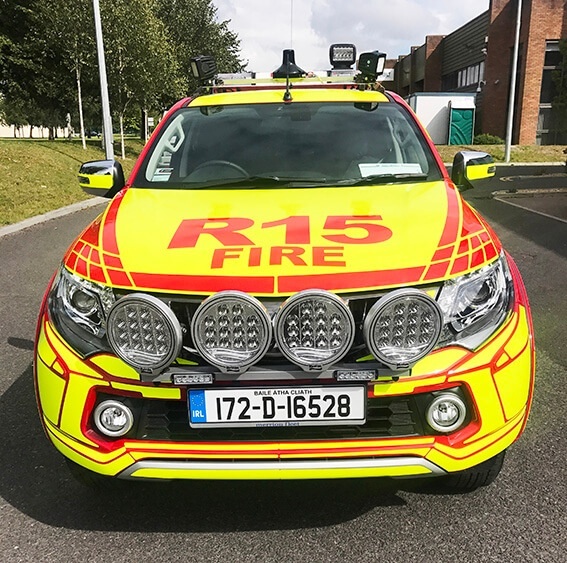 This year we showcased our work on the R15, one of the latest vehicles that the Dublin Airport Authority have added to their fleet. It started off as a Mitsubishi L200 before it arrived for transformation at the High Visibility workshop at Esmark Finch. 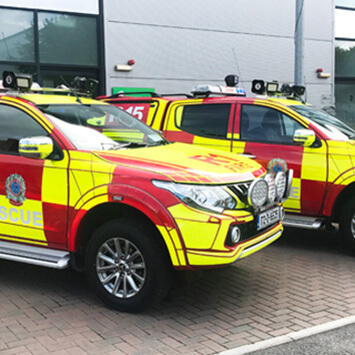 The Fire Station at Dublin Airport is a 24 / 7 operation. Of course, Fire & Rescue are their primary role but the job is much bigger and more complex than that. The airport is vast, comprising of hundreds of acres of grass land. This is very attractive for wild life. Foxes, rabbits and hares all love this precious protected space and of course, we can’t forget our feathered friends, the native birds. All these guests pose a significant threat to the aircraft and the responsibility for controlling the wildlife falls to the Fire Station. 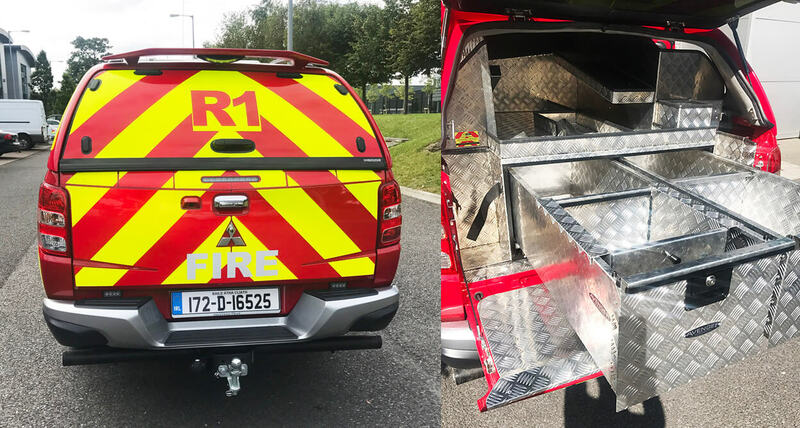 We were asked to work on the R15 and they R1, which are both Mitsubishi L200’s that we specially customised to fulfil the many roles required by the Dublin Airport Fire Station. Firstly, the vehicle is operational “airside” – so it must be highly visible to the aircraft. While airside, the vehicle falls under the control of the Air Traffic Controllers. A specific section called “ground control” looks after the movement of all the aircraft while they are on the ground and in addition they also look after all the vehicles moving around the air field – this of course includes R1 and R15. The auxiliary roof bar has a transponder (the black cone shaped object on the front of the vehicle roof) on it and while operational airside this will be activated. This allows the vehicle to show up on the radar just like the aircraft. If they want to move around the airfield they must first get clearance from the ground traffic controllers. The vehicle operates 24/7, so visibility at night time is vital. After 11pm the airport comes alive with workers. Projects like runway north (new longer runway 3kms away from airport) and the resurfacing project all start up. The R1 and R15 are responsible for carrying out a detailed inspection after the work is finished. They must carefully inspect every inch of runway and link roads to ensure that the builders have left nothing behind that could cause harm to an aircraft. 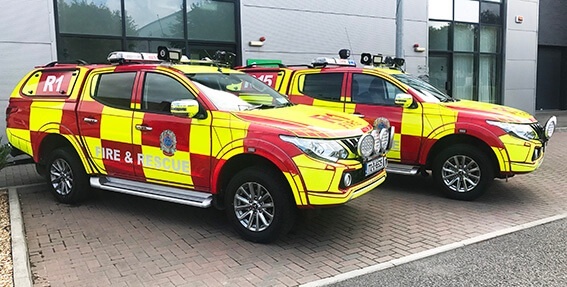 This is why these vehicles have 4 flood lights on the front and 2 additional very powerful flood lights on the auxiliary roof bar. Known as the “side inspectors”, this offers near daylight conditions to both sides of the vehicle ensuring the eagle-eyed operators don’t miss anything. During the day, the native birds pose a real threat to aircrafts. Ingesting a bird into a jet engine at a critical moment can be hugely risky which was highlighted with US Airways Flight 1549, an Airbus A320. Shortly after take-off the aircraft struck a flock of birds and both engines flamed out. As they were only 3 minutes into the flight they had not enough altitude to get to an airport nearby. The pilots on board were Chesley Sullenberger and Jeffrey Skiles and they successfully glided the aircraft and the 155 people on board to a safe water landing on the Hudson River in New York. Incidents like this highlight why birds near airfields need to be controlled. The R1 and R15 have a host of tools on board to help in the war against birds. Special bird scaring guns that launch a small explosive charge into the area where birds are resting, creating a loud bang, are on board the vehicle. Shotguns, air rifles and other gadgets are all available to the driver. Everything has a place so it’s easy for the driver to get at things quickly. On the auxiliary roof bar are 2 speakers – these are used to help win the war against birds. 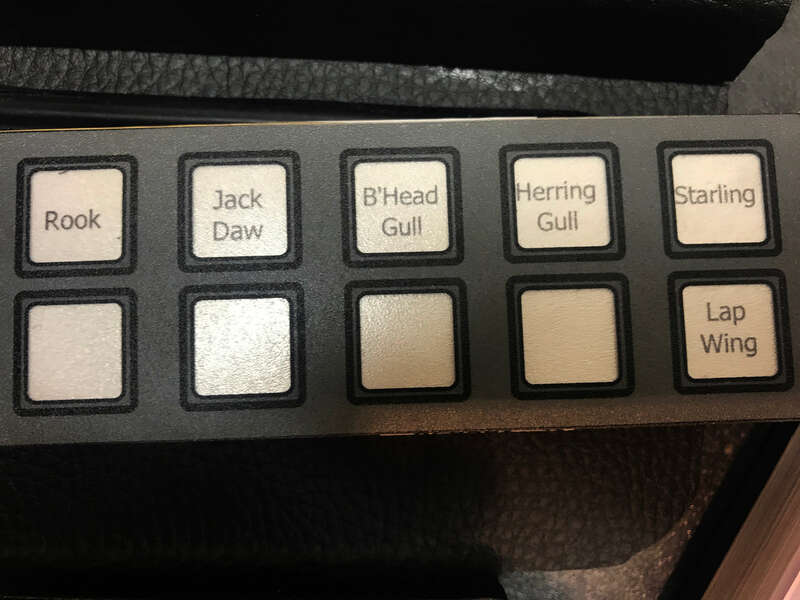 The operator has a control panel in the front so he can choose up to 6 native birds (Jack Daw, Rook, Starling, Lap Wing, Black Headed Gull and White Headed Gull). If he selects the appropriate bird it will broadcast a recording of the chosen bird in distress. This has the effect of reinforcing to the resting birds that the airport is not a safe place for them to set up home. The back of the vehicle is heavily customised. Space is provided for 2 large fire extinguishers, a litter picker, brush and shovel, crow bar, emergency lighting, first aid kit and of course personal protective equipment like gloves and ear defenders. Of course the driver is also a full time fire fighter so he has to have all his heavy gear with him in case he needs to respond to an emergency. The vehicle is equipped with 3 types of emergency lighting. Reds- for additional visibility while the vehicle is parked up. The vehicle also has scene lighting on both sides and the back. This illuminates the outside of the vehicle when parked up so the operators can safely exit. 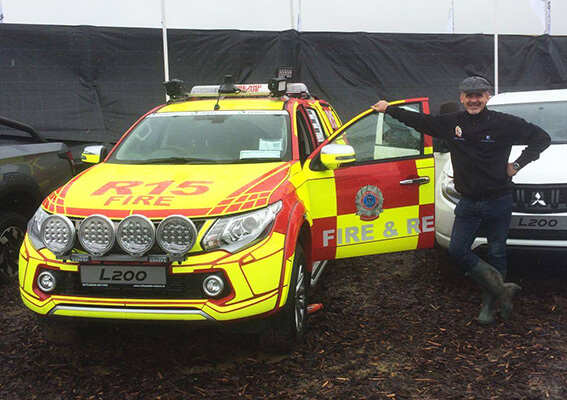 We received great interest in the customised L200 on display at the Mitsubishi stand at the Ploughing Championships this year and are already looking forward to next year. The R1 and R15 are in active service right now, so why not keep an eye out for them if you are flying in or out of Dublin airport!